It’s been a while since I’ve written a blog post on GEB. But, I have been following both the blog and Google Earth closely. I had intended to do more writing during the past year, but frankly I’ve been seeing some rather negative signs in Google’s mapping technology and have been reluctant to mention them waiting for more positive news. Unfortunately, the trends just seem to keep getting worse. Before I dwell on the negative news, let me just say that I still believe that Google Earth continues to serve as an invaluable tool for visualizing the Earth (and other planets) and for creating and sharing maps and other content. The content and the visualization capabilities are still amazing. I’m still a huge fan, I just wish that Google would continue to devote itself to pushing the technology forward. Google’s pace of development for new Google Earth technology has been dropping. For a long time, many of us who follow the technology have suspected Google would continue to migrate features into the Google Maps platform. However, despite the recent release of the “new” Google Maps for desktop, the news continues to get worse. Maybe Google is developing something new in the Google Earth vein, but, if so, they have been very quiet about it. 1) Google Earth on the desktop has not seen a major new release since February of 2009 when Google release version 5.0. Version 5 introduced major new features such as Historical Imagery, the Mars mode, new 3D terrain, the ability to record tours, and a host of new support features for developers. All the versions for Google Earth on the desktop since that time have only added a few new features, interface tweaks, and bug fixes. No new major push for improving the technology or adding new capabilities. During this time, development focus seemed to be on the mobile mapping platforms (more on this below). Some bugs in Google Earth have remained for years now (one despite my having reported it multiple times – an easy to fix bug in Google Earth’s flight simulator). 2) Support for GE developers has dwindled. Evidence for this can be seen by the drop in news about new applications using Google Earth, the plugin, or KML. The new Google Maps version does not directly support the old “My Maps (originally called My Places)” for creating custom maps. It now uses Google Maps Engine which doesn’t even support KML – you can’t import a KML file into Maps Engine (although you can import My Maps, but you can’t create new My Maps). What’s up with that? Instead of more support on the Google Maps platform for Google Earth features (like the fundamental KML standard), they aren’t even supporting it? Very few developers of the Google Earth platform, who regularly appeared in GEB in the past, have released anything new in recent years. The GE plugin is apparently dying a quiet death, there are no signs Google is trying to replace it with something new. Some developers are migrating to other non-Google platforms. 3) Marketing: Since 2008, Google’s main platform for sharing news related to Google Maps and Earth technology has been the Google LatLong Blog. In recent months, the number of posts have dropped dramatically on their blog. Also, activity on the social network accounts has also dropped. It’s a bad sign that even Google isn’t marketing their Maps and Earth efforts as frequently. 4) In my opinion, Google’s support for active users of their mapping platforms has also been trending downward. Google put a big emphasis on crowd-sourcing as a way to generate new content in the early days of these platforms. And, to Google’s credit, they did a lot to support the communities they helped create to do these things in the first few years. Understandably, technology has enabled Google to do some of these things without the need for crowdsourcing. For example, when Google sold Sketchup – the 3D modeling platform Google bought to encourage crowd-sourcing of 3D buildings for Google Earth/Maps. Instead Google is now generating 3D Building models in house using photogrammetry automation technologies. They no longer accept 3D buildings built by users for inclusion in Google Earth. Another example is photos. The Panoramio and PicasaWeb platforms that form the basis of geo-tagged photo layers for Maps and Earth. We haven’t seen a lot of new features on those platforms recently, and I suspect they will somehow migrate this to the Google+ photo platform in the future. I’m worried a lot will be lost in the transition. Meanwhile, they have put increased efforts instead in Street View technologies bringing automated photos in-house again. The Google Earth Community discussion forums migrated to a new Google-built platform a few years ago. My sense is that participation dropped significantly in the transition – although, these other trends above have probably contributed. Last reports I have is that Google is still supporting crowd-sourcing for map building in countries that otherwise have no data available. 5) The mobile platform has probably been a big distraction resulting in a lot of these negative trends on the desktop and for Google Earth in particular. The Google Maps app has certainly been a major win for Google in the last couple of years. It was so popular that when Apple tried to remove Google Maps from iOS and replace it with their own inferior app they had major backlash. Google’s new Maps app was quickly the most-downloaded app on the iOS platform when it was released. Google has continued to devote a lot of attention to the Maps platform on Mobile for both Android and iOS. However, the primary focus is mostly about navigation and finding places – not so much about creating maps, sharing, and visualizing content by other people, or supporting third-party maps applications. The Google Earth for Mobile is ok for basic visualization, but support for creating and importing maps/KML has always been a weakness on mobile. Also, the 3D capability while present, is awkward to use on the mobile app IMO. These are just a few of the things I’ve noticed. Maybe other people can add their thoughts in the comments below. Please tell me if my analysis is off base, I will gladly retract if there are facts showing I’m wrong. In closing, let me say that Google has been a fantastic company for advancing the pace of mapping and 3D visualization technologies. Some of the smartest people in the world work there. And they proved in the first few years of Google Earth that they could amaze everyone. I’m hoping they will pull a new genie out of the lamp and introduce some major new advances in both visualization and mapping technologies in the near future. I think there is still plenty of new things that can be done with the wealth of content Google has for geo-spatial, especially with the continued advances in computer graphics, processors, sensors, mobile, and Internet bandwidth. Whether that would be a new Google Earth (how about Google Universe? ), VR, or something totally new, I would be thrilled to see something that would be as life-changing as Google Earth was when it came out in 2005. Come on Google, let’s see what you can do! Excellent article, I think Google could improve the images of underwater terrain (especially when deleted islands such as the Serrania and Bajo Nuevo , Quitasueño , Roncador Cays in the Caribbean) , would be nice browse the seabed and see the terrain properly especially in the deeper pits . Improve aerial views ( cover more places, better definition , as it is in Leyden , Netherlands ) , accelerate the implementation of Google Street View in most countries, improving the maintenance and updating , improving 3D render , illustration : the Buenos Aires leaves much to be desired. In heaven so , place the solar system planets , their satellites, so far discovered extrasolar . If possible, do as Mars and Google Moon , as the Sun and the other planets of the solar system. Smooth the north and south poles , the images are terrible in those sectors. We must have patience Google Earth is a wonderful invention, if all commented surely help to improve . Please write your suggestions. Thank you. 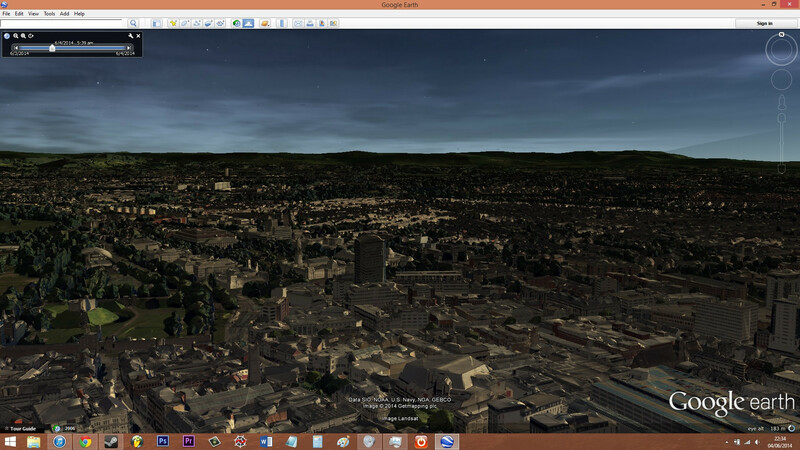 I have noticed similar trends and have expected the slow decline of Google Earth Desktop. Maybe Google is working on an offline app to work with Chromebooks? Maybe more features will be added to Google Maps? Fingers are crossed for both of these. Google earth will die. Sadly, google will invest on profit making solutions like google maps and google plus. google is not interested anymore in providing innovative visualisation solutions for the gis community. Sadly for us. It seems to me that Google has nearly entirely abandoned KML. It is a powerful format, but never really got a start with 3rd-party developers since creating clients that support it’s advanced features like NetworkLinks is difficult. With a lack of momentum on Google’s end, it seems the format might be doomed to relative obscurity. Which is a shame, because there is nothing really that can fill it’s shoes. I’d much rather represent data as GeoJSON, but GeoJSON lacks support for styling, regionation, lazy loading of large datasets, etc. My guess is that the new Google Maps with Earth mode will eventually replace the Google Earth desktop client, as well as the browser plugin. Were a Google Maps API v4 to come out, with support for KML and the 3d view, it would be a great improvement over the current situation. Hopefully that’s in the works and this transition has just taken longer than anticipated. I cannot agree more with this. I myself was involved in making contributions to Malmö, like the Öresund bridge for example. And i am still a big fan of Sketchup, but when they dropped Sketchup and removed the support of adding 3D models i lost interest in running Google Earth. I was always looking forward to see new buildings popping up around my neighborhood. But I really enjoy that Malmö now is in full 3D and hope to see this in the GPS navigation on my Android phone. What you didn’t mention today was that Google’s new “Project Tango” is lurking around and we don’t know what people will do and can do with this. There could be some new areas to work with here. Maybe people with the new devices can map both indoor and outdoor as a complement to street view. I think the new “Earth View” in the google “Maps Preview”, that was built with WebGL technology is the most valuable sign for the future of GE. The desktop application can goes down, but the WebGL browser version is true thing for the future of GE… What do you think Frank Taylor? @Rogério I think the WebGL “Earth View” mode in Maps Preview is a sad subset of Google Earth and barely serves as a constrained 3D view on the Earth. Google Earth has way more capability. Frank – an excellent post. Absolutely spot on … throughout! You pull together many points made in GEB comments, but may I add that the increasingly variable quality of imagery updates would also indicate a lack of resources invested in Earth. 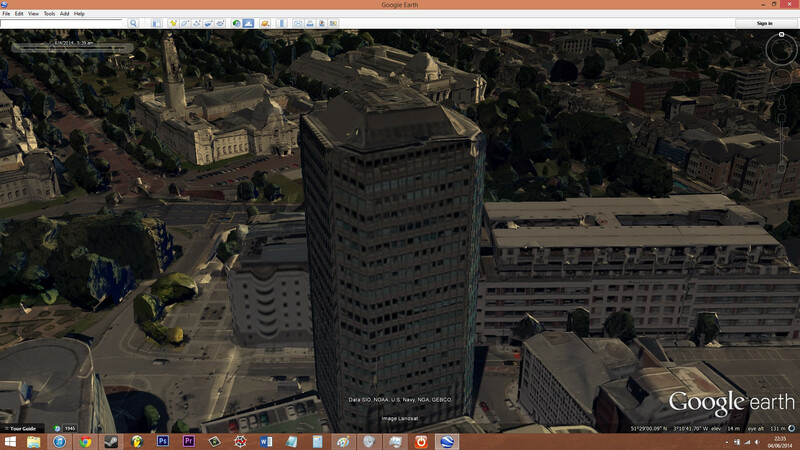 However, the investment in Street View, and the extra ‘dimension’ it brings for virtual travellers, is well spent IMO. It all seems to be about novelty … and monetisation … Earth is a mature, intelligent product for desktops with less potential for harvesting data, and hence money, than proliferating mobile devices with new ‘lite’ Maps for what are perceived as undemanding, unthinking users. The fear is that Earth will simply merge into Maps with a huge loss of features. The hope is in your last paragraph – that Google will realise that all the content, technology and power is there to leap ahead with a brand new Earth again at the cutting edge of geographic visualisation. Leave my Google Earth alone! i dont under stand google maps its hard to use! but Google Earth is awesome. I would like to see volumetric clouds in real time i envision huge improvements on the weather graphics aready have rain but snow and lightning would be cool. I agree with the comment above adding the other planets of the solar system like they have done with mars and the moon would be cool and very educational. thank you GOOGLE keep it going. Frank Taylor & Mickey Mellen for keeping this blog going i check on it every day. Last reports I have is that Google is still supporting crowd-sourcing for map building in countries that otherwise have no data available. Mapmaker is still available and I have used it to do update street names and correct other things in Livingstone, Zambia. But it is not restricted to ‘countries that otherwise have no data available.’. I have added a small street in Florida, USA without any problems. From all of the evidence I’ve seen – including the leaps forward in using WebGL in the new Google Maps – Google are hitching their wagon to entirely browser-based WebGL for 3D visualisation. Apart from the new GMaps there are umpteen open source implementations (Cesium, Google’s own Chrome Experiments, WebGLGlobe, Globe+, OpenWebGlobe, …) of 3D globes. Its still got its share of rough edges but it’s maturing fast and hardware is gradually catching up. Great commentary, and I agree completely. KML is open source and many, many companies are using it, but as good as it is it isn’t the easiest to use in programs or on the web. I cannot imagine a world without Google Earth – it is such an amazing program (and an amazingly large database behind it). Google is focused on monetizing their assets (they are a public company and there is nothing wrong with that), but it has been difficult for them to do that with GE – simply because of the huge costs in collecting and maintaining up to date information worldwide. As a geologist the one feature I have always wanted is a way to show the underground geology (lithology, faults, etc.). I had met with a proposed to Google a way to do this using “pull-up” blocks and slices. So much of this information is in non-standardized paper format, it would be a huge undertaking on a worldwide basis – maybe something more on an academic or government level than GE. Thanks for the blog – I’ve followed GE Blog for years. I don’t use Google Earth much but I use Google Maps a lot — the old Google Maps that let me make maps and export them to KML files for backup just in case Google someday decided to take it all away. I’ve always made it a practice never to put my data into a system from which I couldn’t get it back out, so the new stuff is useless to me. I think the big thing thatGoogle is missing by not enthusastically supporting GE is the amazing Educational tool it supports and fosters . GE is becoming a go to tool in the advancement of spatial awarnesss and it ‘s ablity to link what and where together so easily and seamlessly has become a powerful tool . This is especially needed within the north American enviroment where spatial understanding at all scales and levels has been last for many decades . the ease of use of GE and its ablirty to integrate vast quantities of Information through the concept of a spatial journal is a must go to for students and educatorsd from k- through Higher Ed . Why is Google ruining the Pretty Earth Effect when zooming in? The effect is no longer nice when zooming in many places like Egmont National Park in New Zealand. The annoying rectangles are clearly visible again. Will Google ever fix this mess? The “annoying rectangles” are areas of higher resolution. At the upper earth view everything is a nicely color-matched/cloud free mosaic but if you were to zoom in on that data is would not show much detail. Google does not have high resolution imagery for very since square inch of the planet, but GE includes whatever is available, hence the patchwork effect as you zoom in. Google Earth is being ruined with all these weird rectangles and the very dark colors. Look at Istanbul’s new images. The city is now so dark that you can’t tell what is what. What’s the matter with Google? It seems like they’re now just interested in fighting patent wars with other companies that they forgot all about one of the best products they ever released. Google Earth has a future in my opinion. I don’t think it’s going anywhere. In fact it will probably get better and it wouldn’t surprise me if Google releases revolutionary improvements for Mars, Sky, etc. Plus I also expect the whole Earth to become 3D in the next ten years, and I expect the 3D mapping to become clearer than it currently is. But I just wish they go faster a little bit. They’re too slow, Google Earth seems to be marginally improving per year. However, the rate is very slow. But first and foremost, they seriously need to get rid of the new dark imagery that they’ve released because they’re not helpful at all. Istanbul has become ugly with the dark imagery. Sochi looks ugly too. Some places in New Zealand now look ugly. All the imagery in these places have been darkened and it doesn’t make sense why Google has done that. Sort it out Google! Anyway, overall I am optimistic. I think Google Earth has a bright future, but certain things need to be ironed out. They need to improve the experimental atmosphere feature before it becomes official. They need to readjust the colors and make them clearer and more realistic. And they need to continue making the Earth look prettier. The 3D mapping is one of the best things they did in recent years. They need to quickly make all major cities in the world 3D and then find ways to enhance the quality of the 3D imagery. All these things can be accomplished with the technology they have but they’re taking their sweet time with it, which might frustrate some people. Mabye one reason for the stalled development of GE is the uncertaintity regarding its IPR situation. Google Earth’s history can be traced back to a system called TerraVision from the mid 1990s, which was inspired by Neil Stephenson’s ideas expressed in his novel ‘Snow Crash’. I would like to the restriction of only 2 obliqueness options and only 4 directions to view in removed in Google Maps. It makes it awkward to use. I’d also like to see improved 3D imagery in Google Earth, seeing as they could overlay the data from Google Street View onto the terrain. Also, volumetric clouds and detailed night lights. Google no es una compañia de productos geo-tecnologicos. Google utiliza estas tecnologias para crear espacios publicitarios, donde poner sus anuncios, solo busca eso. Google puede utiliza muchas tecnologias atractivas, para crear audiencia y generar ingresos por publicidad. Google Earth no es un lugar donde se puede google puede ganar dinero con la publicidad..
A google no le importa el avance en la tecnología de mapas, solo busca publicidad..
Todos sus productos, son unica y exclusivamente creados para obtener ingresos por publicidad. Despues del cierre de la creacion de modelos 3d para Google Earth, en contadas ocasiones uso sus productos, solo gmail y por que estoy atrapado en el. Google no es nada ahora en mi vida .. solo es uno mas, y es de los malos. Google es publicidad, al igual que los aburridos anuncios de la televisiones, el resto son herramientas para mantener audiencia y vender su publidad..
Llevo semanas haciendome la pregunta, que va a pasar con el blog de GE, estoy sintiendo que el contenido ha bajado de calidad, pues la gente ha huido y no desarrolla con el plugin GE. Tampoco se modela en 3d, esto es muy grave..
La realidad es que Google ha incitado a modelar tu ciudad hasta que le ha interesado, y ha habido gente que aposto su profesión a crear tecnologia con mapas, o construcciones 3d de sus ciudades bajo la peitición de sus gobernantes. Conozco una persona que puede perder su casa, debido a la falta de ingresos por trabajos 3d. El aposto fuerte con la tecnologia de GE y Google nos apoyaba a todos los modeladores, ahora el banco le reclama su casa..
Googe nos invito a eventos, ciudades, y nos empujo a trabajar con esta tecnologia GE. Como todos sabemos hizo limpieza, y mando a la basura todo este mundo. Ahora he cambiado a nokia y windows phone, y estoy feliz de descubrir cosas nuevas que con Google no tengo.. Como mi camara de 41 mpx, las mejores fotos en un movil..
Google no existe en la tienda de aplicaciones windows, solo el buscador… Google tiene terror a microsoft, y microsoft ahora es mi alidado. Animo a que usen un nokia con buena camara, 1020 o 1520. Con nokia he descubierto un mundo nuevo, mas cercano y familiar, ya que ahora no hace falta llevar mi pesada camara reflex para las fotos de mi familia..
Gracias Franks por encontrar alguien que se atreve a debatir sobre estas cuestiones..
Para mi Google esta muerto. no me gusta la publicidad. Love Google Earth Stand Alone Program. My main use is Fire Mapping of Wild Land Fires and it is an excellent too far above ArcGIS and ESRI for my needs. I’ll use Google Earth Stand Alone until it dies. No other software I have found does what this program provides and in an easy to use interface. hi, one day Google say Google Earth is finished, only is time question..
they do not want to use google earth, they want you to use Google Maps API ..
Google Maps is horrible and I looked seriously at ESRI and AcrGIS and was NOT impressed at all. Google Earth Mobile is not viable for the service work I do either for my region. with ESRI, no … pay for and attend the service ..
neither ESRI or ArcGis are not as fully customizable as Earth is. I tried them. Even tried World View. Yuk. To each their own. And, just learned from this article that google earth does not seem to be under active development. Does that mean google will abandon google earth soon? We are hoping that Google is working on a new version of Google Earth that includes a major overhaul of the graphics engine as seen in the latest Android version of Google Earth. However, we do not have any direct confirmation of this. Today, Panoramio’s Photos stoped showing in Google Earth. Google might think Street View can replace Panoramio but this is not correct, Google Street View is not present in mountains and remote areas, but I guess the money is not there so Google does not care. Google is loosing his soul. I am very upset, with this attitude, a time will come when Google loose against a new company.